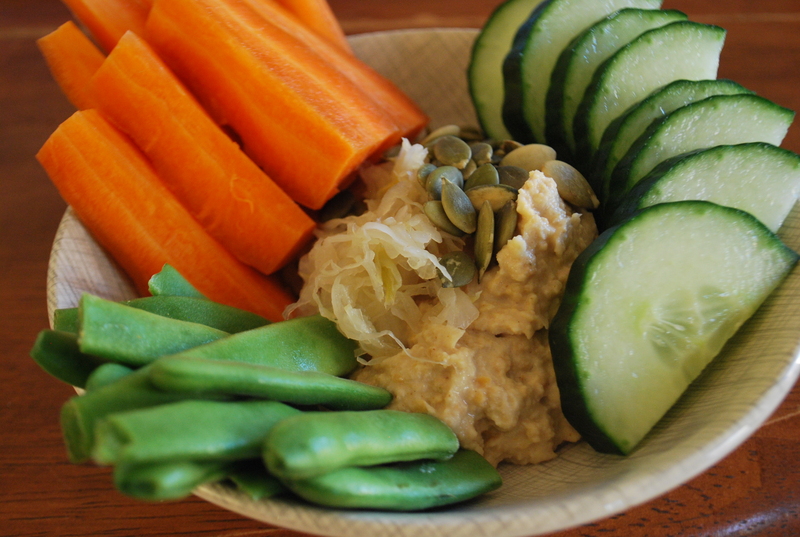 Hummus, sauerkraut, pumpkin seeds, carrot, green beans and cucumber. Sauerkraut is epic with Hummus. Sauerkraut is basically Hummus’ life partner; they were just meant to be together and even though they are both awesome alone neither of them are quite as awesome alone as they are together. Once you enjoy them together you’ll never want to eat ‘just hummus’ or ‘just sauerkraut’ alone again. I don’t know where I’m going with this but you should probably try this basic bowl because it’s clearly more delicious than you expect. 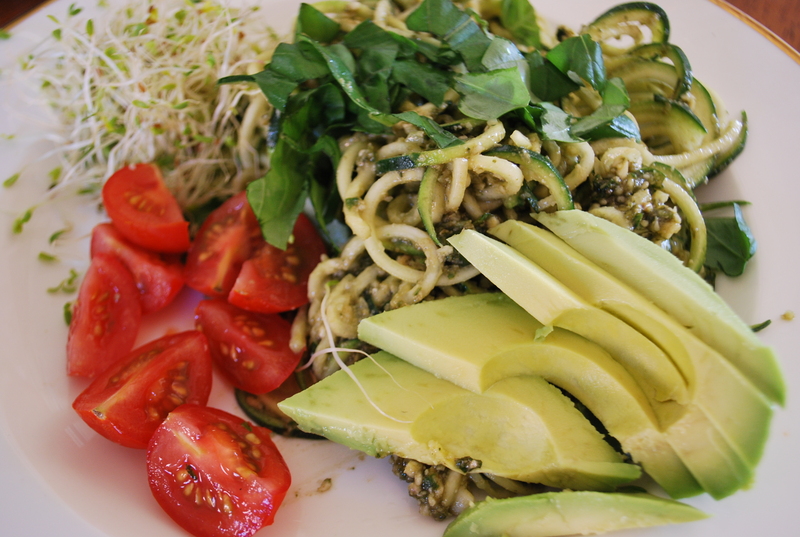 This yumness is pretty self explanatory, but those are spiralised zucchini/courgette ‘noodles’ with a heavy serving of raw pesto and a side of avocado, baby tomato and alfalfa. So, so simple and pretty! 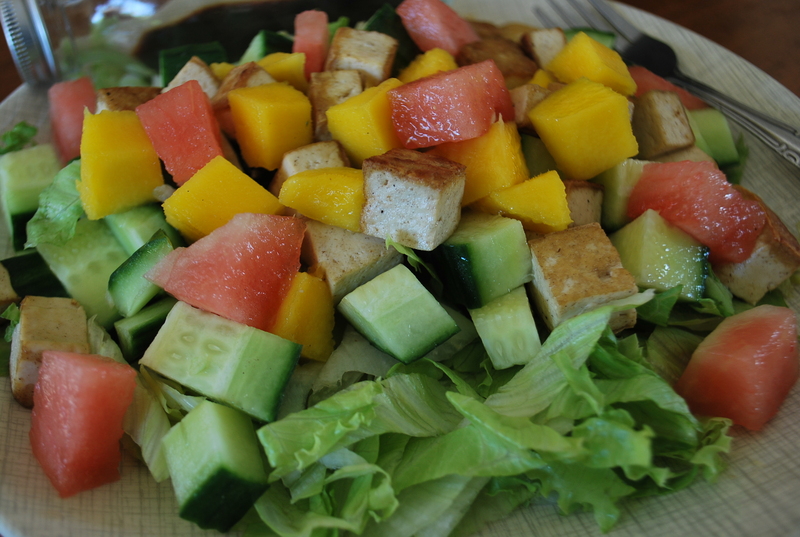 This adorable salad is just fried, diced tofu, diced watermelon, diced mango, diced cucumber, on a bed of salad with a side of balsamic. Balsamic vinegar isn’t absolutely necessary as the juicy fruit acts as a lovely dressing. 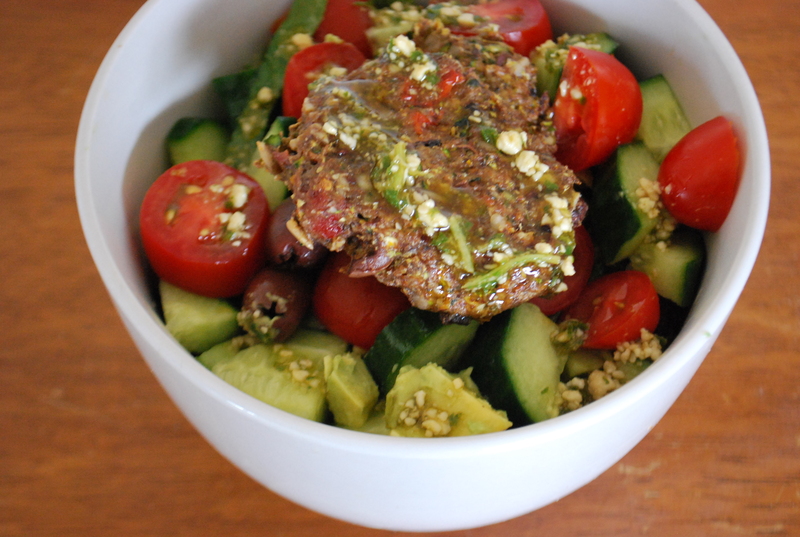 An alternative dressing is to blend tahini and mango with a dash of water and drizzle it atop. Salt if you please! Mmmm, olives are my new thing. I hated them until 2 weeks ago and now I’ve formed a new habit. I enjoy big, juicy kalamata olives. This is super olivey; only for the brave. In terms of raw food this is a big meal! So it might be enough to keep you going all day! Blend all ingredients, form into dough, dehydrate. 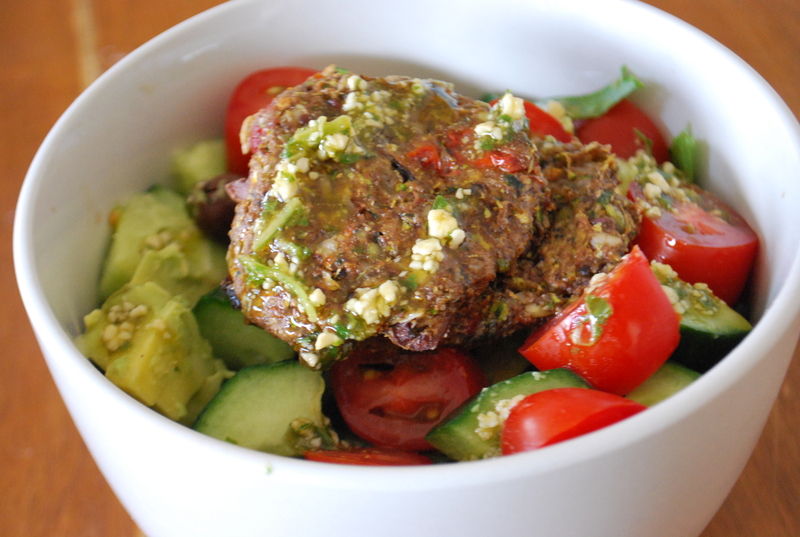 Serve on salad of tomatoes, avocado, olives, cos lettuce and cucumber. 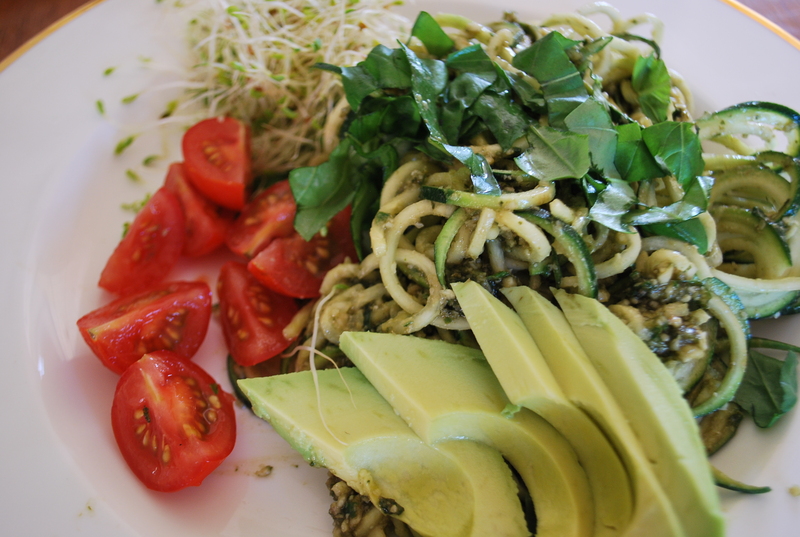 Drizzle with basil pesto (basil, salt, ground cashew, oil). 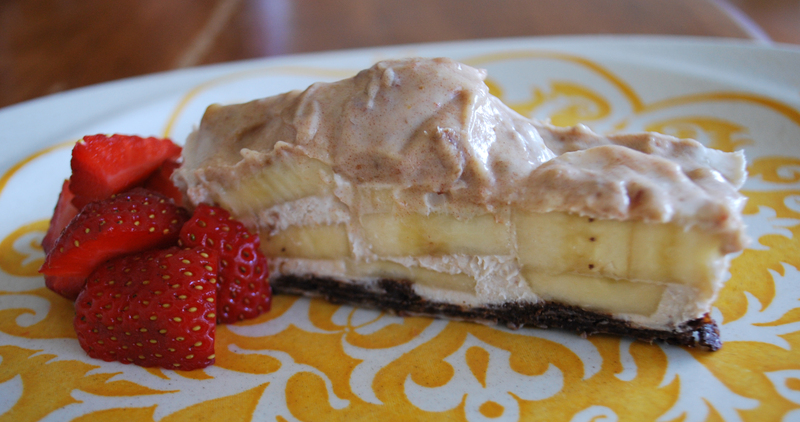 Banoffe Pie is notoriously rich and sweet so I really suggest berries here to offset the sweetness. The toffee sauce is next level; count on it. This didn’t take that long to make, I probably spent about 20 minutes in the kitchen. Dates soften in roughly 5 minutes in boiled water. Blend, then press into a tin. Firm up in the freezer (do not freeze), then serve. 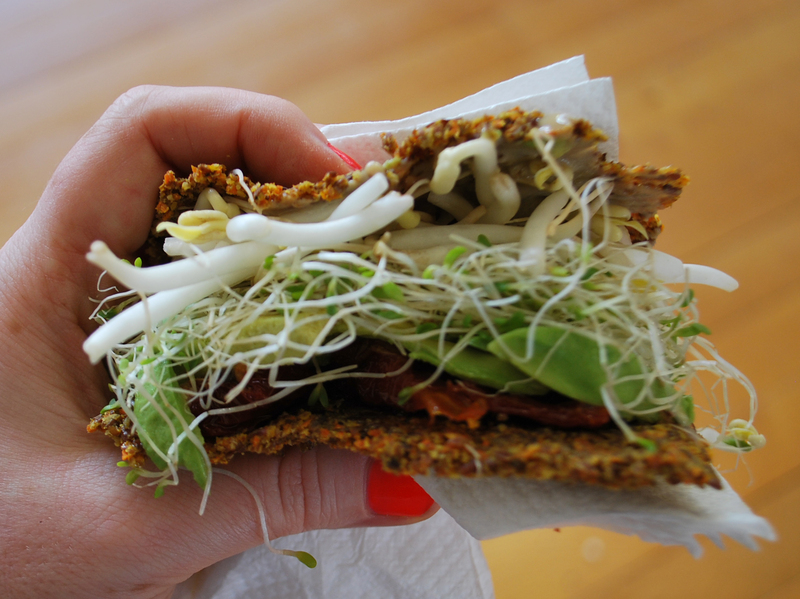 Once I make raw bread – which is incredibly quick to prepare – it lasts for days and then I can throw together beautiful sandwiches on the fly, such as this! 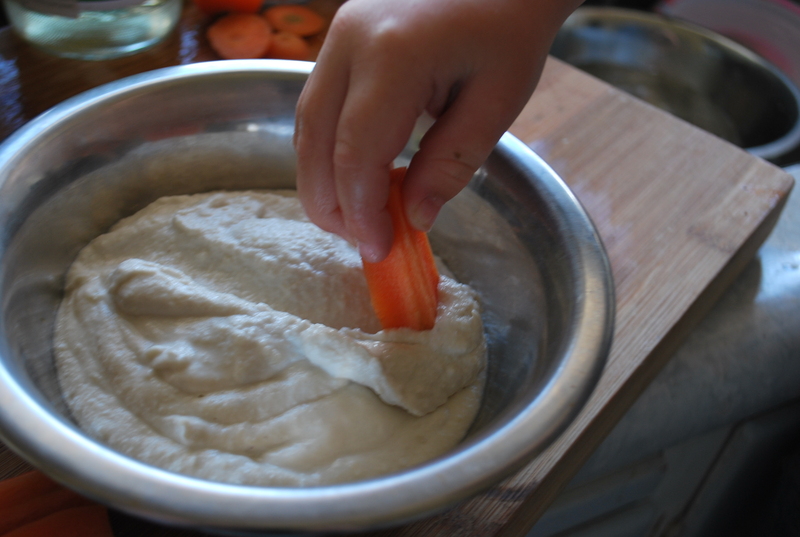 Raw bread simply requires you to put half a carrot into a food processor and process it finely, then mix LSA and a dash of water and a bit of salt until doughy. Flatten out and shape into thin sandwich shapes and dehydrate. Flip half way through. Sorry about the Instagram shot, it’s all I got before it was devoured by my wee boy. This is absolutely delicious for grown-ups or children. 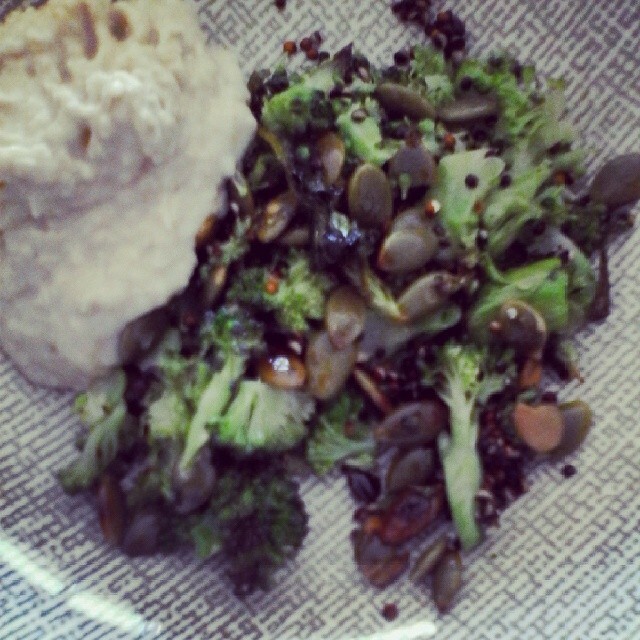 Fried pumpkin seeds, broccoli, mixed with sprouted quinoa (optional) and served with a side of hummus. 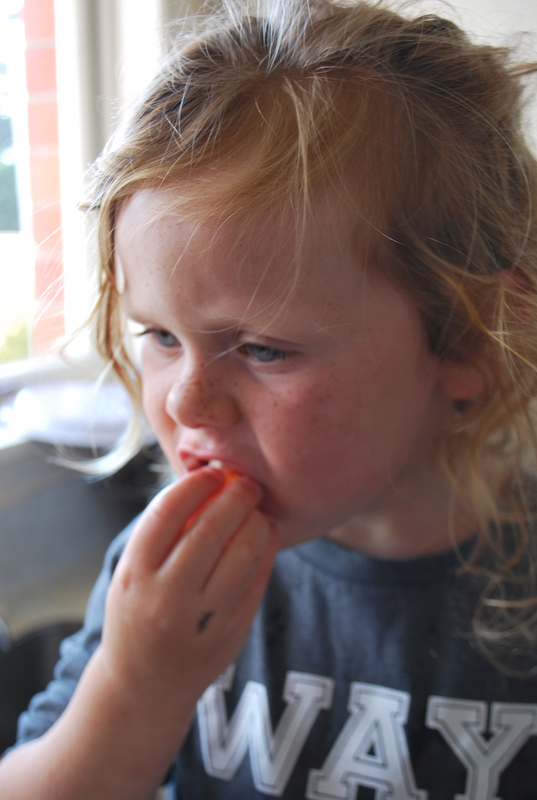 When I’m making it for my son I chop the broccoli finely and mix it all together before serving – delicious! Because I can’t handle the garlic in store-bought hummus I either make my own or serve it with tahini sauce. This is lovely and so easy to make. I’m also happy to feed this to my 15 month old son because it’s not too sweet and all natural! Blend 1/2 cup of LSA, some nuts and seeds, 1 or 2 dates (pitted and soaked for 5 minutes or until it softens) and cocoa. Add some water to moisten into a dough-like consistency and press into a dish. Blend 1 avocado, 3 teaspoons vanilla, 6 dates (pitted and soaked for 5 minutes or until they soften), two bananas and cocoa to taste – I like mine rich, around 3 tablespoons. When you’re satisfied with the flavour spread the mousse onto the base and chill. You can serve this chilled or frozen, I prefer to freeze it and then serve the slices and let them stand for about 10 minutes.